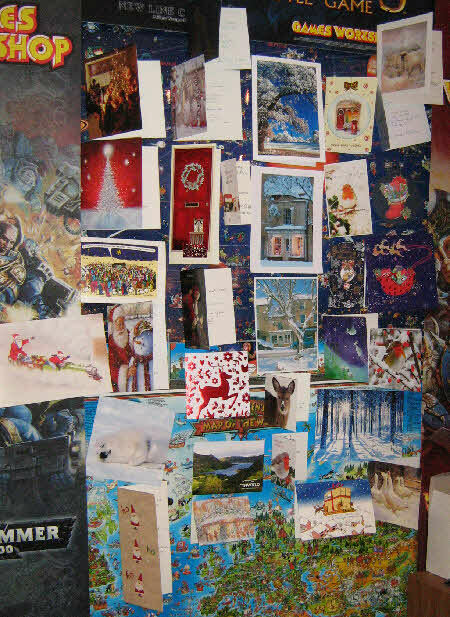 Here are all our cards decorating the space behind the counter. Thanks everybody for being so kind. Thank you for the cards. Thank you for all the cakes and biscuits and all the other gifts. And a special big thank you for supporting us through the year. 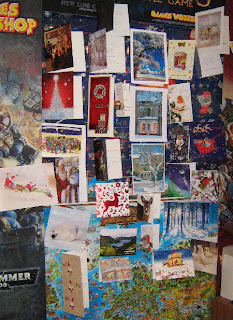 Even a little publicity might help the charity sponsored by the Angel and MS Christmas who were kind enough to frame our collection of Christmas cards. The charity is Women's Aid and you can click to link in to their good works. 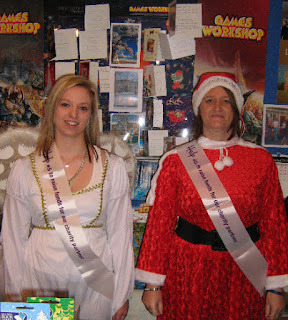 Thank you for calling in ladies, can't be too warm in that Angel's outfit! When you next see me (David, the tall one with a South African Accent), buttonhole me for a contribution. It seems only a little whole ago that a good friend to the shop was introducing us to her remarkable talent and her new book, Little Green Shoots. Now Jenny Henderson has delivered her latest book to Cotswold Bookstore. 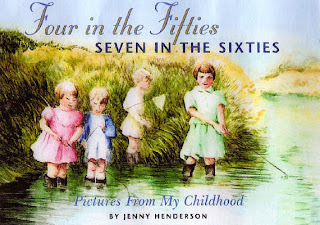 Called Four in the Fifties, it has nothing to do with Enid Blyton's Famous Five after the death of poor Timmy, but is a nostalgic look at a childhood in the 50s and 60s. In fact, the full title is Four in the Fities, Seven in the Sixties. Her jacket blurb - 'It will enthral anyone who can recall the excitement of steam trains, the steamy whirl of washday, of 'Listen with Mother' by cosy coal fires and the safe structured, daily routine of those times.' describes this illustrated book perfectly. Priced at only £10.99, at our store, £1.00 of which Jenny will donate to the BBC Children in Need Appeal, it is the perfect companion to Little Green Shoots and a perfect gift for anyone who remember such times. It's quite some time since we had a dog on the blog and this one charmed us right away. Her name is Muffin and I think, on her next visit, she'll remember exactly where the biscuit tin is. 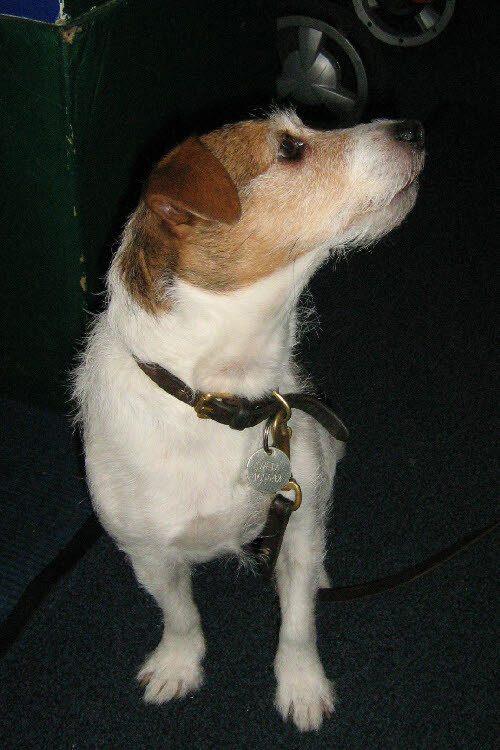 Of course Muffin wasn't the only canine visitor today. Regulars Alfie and Barney were in too. We are pleased to see that the new jacket on Just Henry conveys so much more than the original. The coils of film and the blurred running children on the earlier cover made it look more like a ghost story to me. What do you think? Those of you who miss the film on the 18th Dec. might like to know that there will be a DVD available, but I promise you, there's much more in the bookMind you, I hear that two of my favourite actresses will take part - Barbara Flynn and Sheila Hancock. I still say the book's the thing. The film is a flavour of the book. The script writer, a lovely and experienced writer was basically asked to write a 90 minute drama from a 700 plus page book. I try to explain to people that it's rather like asking a composer to write a short arrangement based on a symphony for less instruments and then put his own creative input into it to make it hang together as a new piece of work. I tell people that they're both related and both different but that I hope people will enjoy them both in different ways. I just hope that the 'Flavour' is a tasty one as it's a terrific book. Many of you will now know that we stock Games Workshop products and some will wonder what it's all about. Well, they have an excellent article on their web site at the moment. Just click the link above and read all about it. 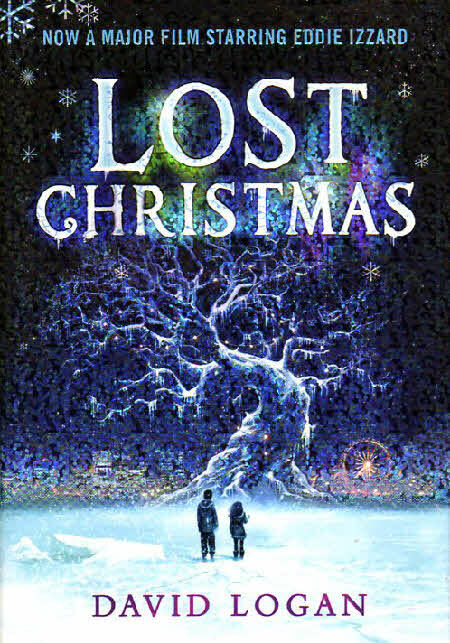 Here's a new book that we have been enthusing about, Lost Christmas by David Logan, and that too is to be on television. And on the same night too. Starting at 5.30 on Sunday 18th December on BBC 1, it runs right up to the start of Just Henry (see previous 2 posts). Hope you don't mind me repeating our recent review. When 11 year old Richard (or Goose, as he is known), hides his Dad’s car keys, a chain reaction of disasters occur. Now jump forward one year. Goose is living with his Nan, who we first meet trying to cook the Christmas Turkey in the washing machine. She suffers from Alzheimer’s but Goose dare not tell people how bad she is for fear of ending up in a home as his parents are both dead. His father’s best friend, Frank, fences goods that Goose steals but tries to look out for him. It is Frank who first comes across Anthony, a stranger who quotes facts like The Guinness Book of Records and seems to know an unusual amount about everyone he meets, more, indeed, than he knows about himself. A stolen bangle, a missing letter, Goose’s dog and a family drifting apart after the death of their daughter are all linked by the stranger’s knowledge and one by one, he brings them and Goose together in a moving story. Described in one review as ‘It’s a Wonderful Life’ meets ‘Shameless’ this is an uplifting and frequently funny tale of ‘What if’ with a Christmas theme. This book starts in late 1949 and fourteen year old Henry lives with his mother, stepfather, little stepsister and his Grandmother. Henry knows his father died a hero and ‘Uncle Bill’ does not match up in his eyes, nor in Gran’s. There is conflict enough at home without the new teacher taking against Henry, yet he seems friendly to the two boys that everybody else ignores. However, slowly Henry’s eyes are opened to truth after truth till a photo that he has taken turns his world upside down. This was one of the most gripping and enjoyable books for youngsters that I have read. To write a children’s book that is more than 700 pages long takes some doing. 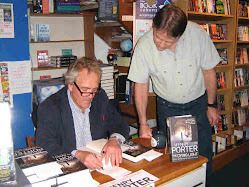 However, to make sure that the reader is captivated for every one of those pages is a tremendous achievement. The author here populates her book with distinct and clearly defined characters which young readers will come to regard as friends - but not everyone in the book can be depended on. It is the gradual resolution of one mystery after another that involves both Henry and the reader in this terrific tale. The plot moves from one puzzle to the next with obvious care and simplicity so that, despite its length, the story is over all too soon. For the younger reader, there is much social history on subtle display. How attitudes to divorce and single mums have changed! For a reader who remembers the period, it is a luxurious wallow in forgotten memories such as Saturday morning picture shows, the launch of the Eagle comic and references to the films of the time. For all, it is a heart warming, engrossing read. It is ten years since the last book by Michelle Magorian. This superb book justifies the wait and though it was written for youngsters, adults are among its biggest fans. 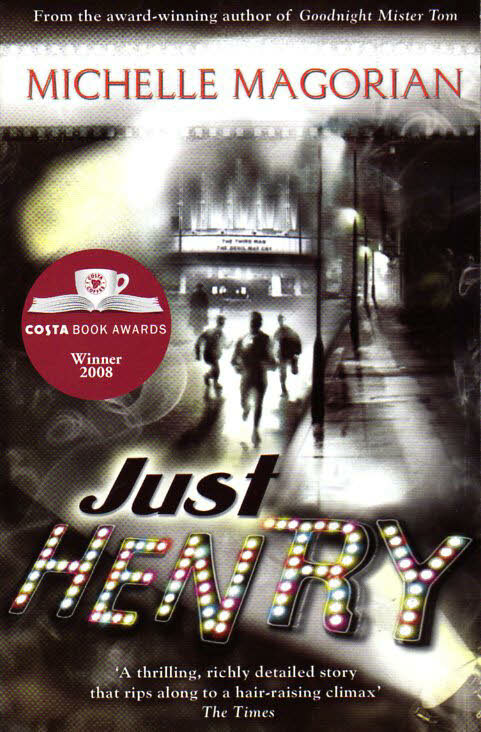 The above was our review for Just Henry on its publication. I then went out of my way to read some of her other books and can highly recommend them. A favourite is A Little Love Song. A must for all young girls! Just Henry - now on TV! We are delighted to see that a book we have championed for the past three years is to be on television. 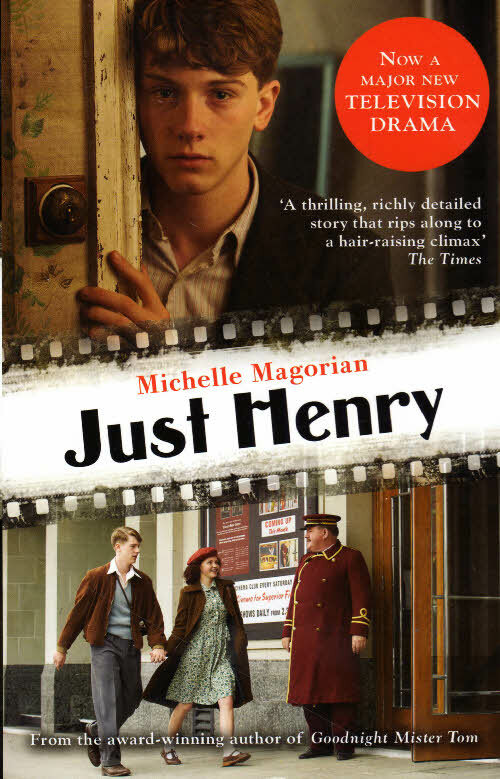 Many of you will have a copy of Just Henry by Michelle Magorian and a lucky few may have one of the limited edition signed copy hardbacks that we grabbed when it first came out in 2008. 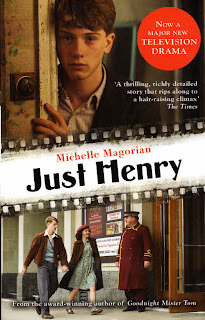 Michelle is the author of Goodnight Mr Tom and, like that novel, Just Henry is rich in history (1949) and character. The youngsters in her book will soon seem like old friends and you'll be tempted to start again, when you come to the end. If you haven't read it and want to do so before the showing on TV (7pm ITV 1 on Sunday 18th December), we have copies in stock, but be quick. With this good news, they may be in short supply. WOW! Even though we have only a dozen copies of Justin Thyme in hardback left, David has decided, with uncharacteristic generosity, to drop the price by another £1.00 while stocks last. That's right. 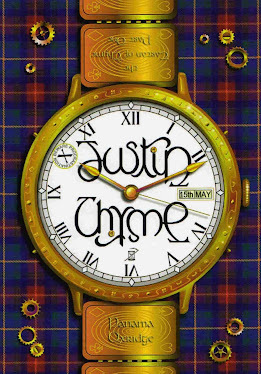 Justin Thyme hardback, now at £9.99 !! !